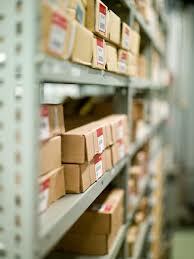 Dolvin's Technology Consulting and Finance Software Blog: Does Inventory Bin Processing Work? Does Inventory Bin Processing Work? Any organization that struggles with inventory at some points wonders if the bin processing feature would actually work for them. Bin processing may have several different names depending on the Enterprise Resource Planning (ERP) solution being used or planned. In its most basic form, Bin processing segments the warehouse facility into discrete named locations. There are different types of bins, some of the most common are bulk storage and picking. Bulk stocking locations are designed for large pallet type ordering and will often contain overstock and is located further away from picking, staging or shipping areas. Picking areas are situated for the majority of picking operations. One example may be, 80% of your orders are by the case and these items are stored in the picking areas of the warehouse. 10% of your orders are by pallet and the remaining 10% are bulk storage for replenishment of the standard picking units. This sounds more complicated than it actually is. The point is that inventory should be stored where it can be replenished and picked with the greatest efficiency. The actual names and percentages are not as important as understanding how your organization stores and picks inventory to fulfill order processing. The question to consider is whether or not you want to trust the computer system to manage that inventory storage. If you cannot trust your system, then you are either using the wrong system, or do not have a system. I was asked recently if I thought Bin processing worked. The organization had limited space, a lot of inventory, and a lot of movement. They were physically moving the inventory and redrawing maps by hand to accommodate the changes. Contrast this with a system that manages where to place and where to find inventory (automatically). There is a lot of overhead in the manual processing this company performs. Regardless, they are doing well. They order, receive, move inventory, pick and ship inventory. They have adapted over time to a system that is an efficient method of inventory handling, for them. Their system would not likely work well with another company’s warehouse. They have adapted. They use the resources they have to operate and fulfill their customer’s needs. When asked if I thought bin processing would work, two thoughts went through my mind. One, they would not be asking if they were running as well as they thought they could. People do not generally look for answers to unasked questions. They are working, operating as well as they could, but obviously they are hitting a performance wall. Not enough space, not enough people, not enough sales, not enough something. Two, the answer is “Yes”, but… yes, if they let (trust) the system do what it is designed to do. Most modern inventory systems work, if you let them do the work. Automated systems look at inventory transactions and movements and will let you know where to store received items and when and where to replenish picked items. They system “knows” where the inventory is. The system “checks” and verifies the locations as inventory is processed (handled). The system “knows” where the inventory is and what to list for picking or put-away operations. The problem usually comes in several forms. One, people try to out think the system. A lot of time and energy goes into a modern inventory (IM) and warehouse management system (WMS). A lot of smart people and a lot of trial and error went into these systems. The systems work. They work if you let them do what they are designed to do and you learn to trust them. Two, some people as well intentioned or negligently move inventory and do not inform the system. People are smart too. People invented computerized systems and recognize their limitations. This is a good thing. This knowledge can be used to further tweak the systems. Good systems learn from their users. The problem comes from people acting independently. If you touch and move inventory, then you need to let the system know about any and ALL changes. The sooner, the better. A nice feature in newer systems is what is called Count-back systems and they are another asset to modern systems that are used to verify and an increase the accuracy of inventory. Count-backs from an overview seem to add extra time to inventory picking, however, in the long run inventory accuracy is enforced and confidence builds. Workers begin to trust the system. For example, if you send someone to a location that should contain 100 cases of inventory and they are supposed to pick 20. This means when they count the remaining there should be 80 left. If there is not, then the system halts until the problem is resolved (bypassed in an emergency). This practice holds the people accountable. They learn quickly that they need to get the inventory processing correct. They have responsibility. So yes, inventory bin processing works, if you let the system manage the inventory. Do not get creative, let the system work for you and not the other way around. It is like cutting wood with a saw. You can force the saw into the wood and get an inaccurate sloppy cut or you can let the saw process the wood at the pace it is designed and get a clean accurate cut that does not need to be repeated, reduces waste and ends-up increasing efficiency (savings). Hopefully this overview makes you stop and wonder if you are taking full advantage of your inventory system and the efficiencies and savings it can bring to your operations. There are many aspects to these systems, the above is just one example. Contact us today at Dolvin Consulting to learn more about what a modern inventory control and warehouse management system can do for your company. We are here and love to help.